#1 – Kabayan Beach Resort (in Batangas): Where is this dream? It’s right where you’ll feel so good, at Kabayan Beach Resort– spot on, in San Juan, Batangas, Luzon. With a little bit of magic – Kabayan Beach Resort will pamper you with love like you’ve never known! Just picture this – as you step into their comfy cozy room, you get enticed to feel the cool breeze of the sea, as you inhale fresh air coming in; then have a yummy treat over at their restaurant. This very relaxing resort features a function room for team building or events purposes; in addition to an aviary that is home to numerous pretty birds, and Philippine Sea turtles to amaze you. Not to mention their oh-so-stunning white sand beach, plus crystal – clear blue ocean water-- these will ultimately banish all your tiredness from overwork in the city… You are so beautiful, Kabayan Beach Resort for your natural ability to bring out people’s energy! #2 - Casa Primera Hot Spring Resort (in Laguna): There’s no denying, that teams who play together, stay together. So come on over at Casa Primera Hot Spring Resort – located at Daang Pag-ibig Street, Nayong Maharlika Village, Barangay Pansol, Calamba City, Laguna, in Luzon – and bring your colleagues, spouse, children and all whom you want to enjoy and bond with! For Casa Primera Hot Spring Resort will truly never disappoint. The reasons? Are many! Take a peek: Ideal for groups are their 3 Private Villas – with free Wi-Fi, exclusive swimming pool, flat screen TV, 100% cotton towels, HD cable, uber comfy beds and pillows, secured indoor parking, BBQ griller; and oh – so – refreshing view of the landscape all around you! But wait, there’s more! Casa Primera Hot Spring Resort –also provides 24/7 security through their CCTV monitored parking area and resort surroundings; free use of videoke, billiards and darts; free use of stove with LPG, refrigerator, oven toaster, rice cooker, ice cooler, etc. Sounds like lots of fun in the sun, eh? #3 - Dona Jovita Garden Resort (in Laguna): When stress surrounds you – turn around and make up for it via a vacay over at Dona Jovita Garden Resort – where time stands still at exactly Kilometer 57 National Highway, Bagong Kalsada, Calamba City, Laguna, Luzon. Let these unforgettable things be the ones you come running to: Bring the entire family or your office team and relax in their Mediterranean Escape, their awesome accommodation with 2 fully air-conditioned dorm style rooms that can house up to 40 people. Another great thing that awaits you is of course, Dona Jovita Garden Resort’s hot spring, located no less that at the foot of Mount Makiling! Isn’t that exciting? What is more, you can look forward to visiting Laguna’s finest: Jose Rizal Shrine, Makiling Botanical Garden, as well as taste the original buco pie, and Mer-nel’s cake, both beknownst in this city; and finally avail of their ultra soothing aromatherapy massage at the end of the day. Life is a celebration, so download optimum excitement via Dona Jovita Garden Resort, now! #4 - Casa Victoria Beach Resort (in Pagudpud): There’s something you ought to know about Casa Victoria Beach Resort – their hearts tell you everything over at Barangay Saud, Pagudpud, Ilocos Norte; as you witness them in action providing all their awesome amenities and hearty services: Hear this - native picnic cottages across from the crystal clear water of the beach; super nice rooms for groups, with full air-conditioning, flat screen TV with cable, and private bathroom with hot and cold shower; Wi-Fi at their superb restaurant, also in front of the stunning sea. Moreover, even your eyes will smile, as you see right in front of you, the opportunity to play beach volleyball with your company team or family; or to indulge in local Filipino and Iloco food; in addition to the chance to take souvenir photos with no less than, the Burgos Light House and Bangui Wind Farm as your background; plus so much more in store to explore in the North! #5 – Cohiba Villas (in Boracay): Grab a megaphone and make a shout-out for yet another top beach resort in the Philippines suitable for large groups: Cohiba Villas Apartments – located in Bulabog, Boracay Island, Malay, Aklan, Visayas! You just can’t stop the hyped-up feeling, so just dance, dance, dance …. And break it down! Because we are revealing Cohiba Villas Apartment’s gems for all you office people or family out there: Take a look! 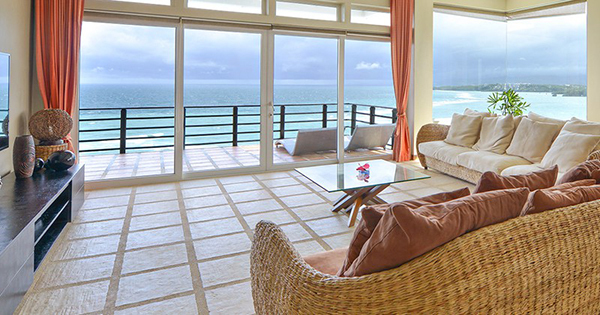 Aside from the noteworthy, world – class customer service, Cohiba Villas Apartments is adorably THE place to be, for their to-die-for cuisine; not to mention you can take advantage of their spacious four- bedroom penthouse apartment, that is situated on a cliff, thereby offering unobstructed ocean view, giving you impeccable serenity and relaxation. Furthermore, once you are well-rested and ready for some action, Cohiba Villas Apartments has got great windsurfing, kite surfing, scuba diving, golf, and infinity pool, as well as White Beach swimming, to keep you and your company oh-so-occupied and ecstatic, as you share camera-worthy moments – which are forever imprints of this treasure beyond measure!